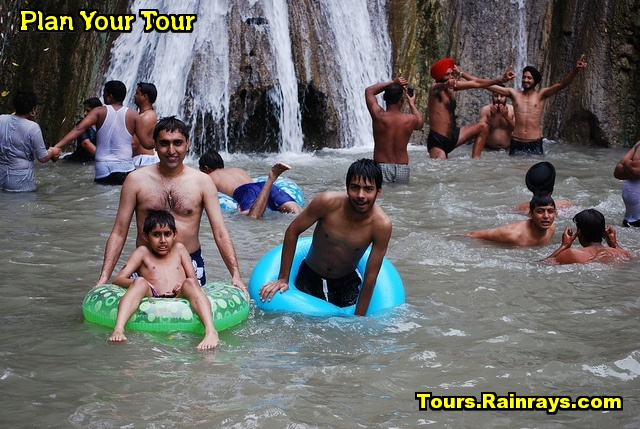 Kempty Falls in Mussoorie are the most beautiful and most visited waterfalls in Uttaranchal. 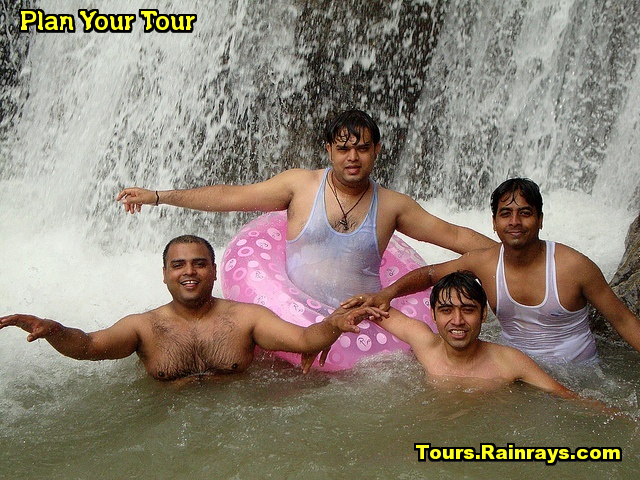 Kempty Falls can be visited round the year except in Rainy season starting from the months of July and August. 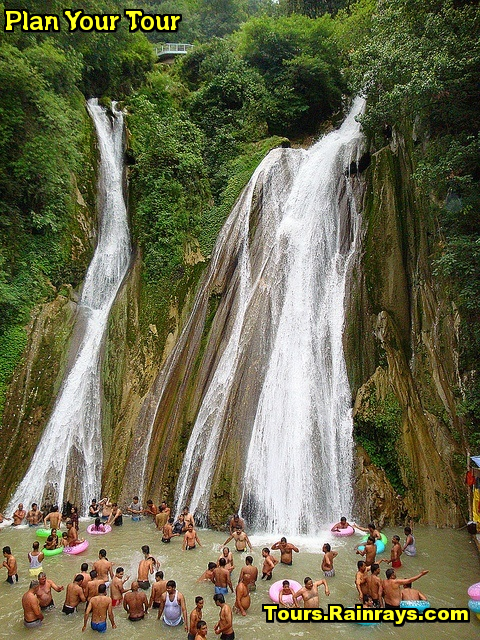 Location : Kempty Falls is located just 15 km from Mussoorie on the Chakrata Road. 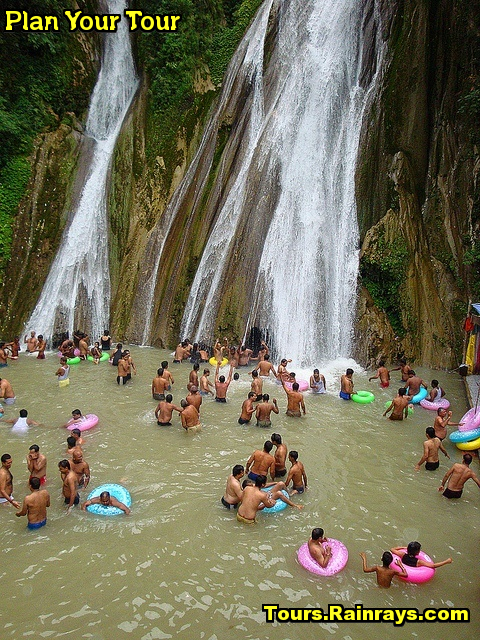 Kempty Falls, situated at an altitude of 4,500 ft. It is most crowded tourist spots in Mussoorie. It is a graceful waterfall, which falls from a elevation of about 40 ft from a mountain. It is is a good place for picnic or for spending a couple of hours in laps of nature. In year 1835, British officer John Mekinan had developed this place for its panoramic surroundings and views. The name Kempty is perhaps derived from the word 'camp-tea'. During the colonial rule, British would organize their tea parties here. Thus, the colloquial name 'Camp-Tea' earned it the name 'Kempty'. Kempty Falls is the largest of the five fount that emerge down from the mountains to flows down through various rocks and finally enters into the plains. This places is also popular for swimming and fishing activities. Here tourist taking bath under the falls and for enjoying the charming views of surroundings. After 12 km downhill and after crossing the Aglar River, you can reach the Yamuna River. If you are interested in fishing you can head to the sacred River Yamuna. It is an ideal place to relax and unwrap the area around the Kempty Falls. It also has various shops that sell artefacts and souvenirs. Best Time to Visit : Best time to visit Kempty Falls is in the month of June to October.